What is the fastest comfort food you can make? Aside from a bowl of ice cream, or something store bought, I think grilled cheese is probably the fastest comfort food recipe in my repertory. In about 10 minutes you can go from desperately hungry to content, and you only dirty one pan! 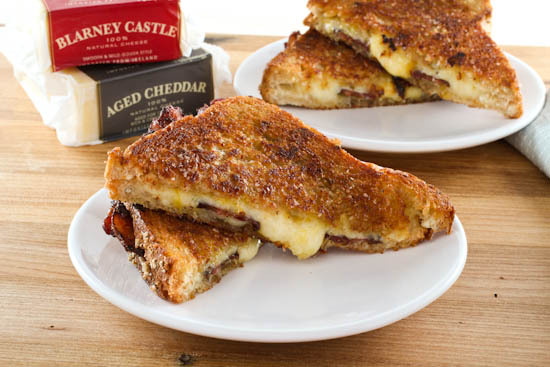 This grilled cheese also satisfies my need for sweet and salty as it has hot utney and thick sliced smoked bacon added to the mix. This sandwich really ticks all my boxes for comfort food. 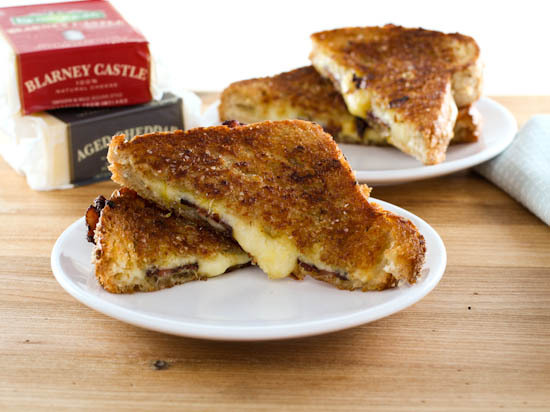 Plus, it uses two kinds of Kerrygold cheese – Blarney Castle and Aged Cheddar – so it also satisfies their April challenge to create my ultimate grilled cheese. I must say, this is among my ultimate grilled cheese sandwiches. 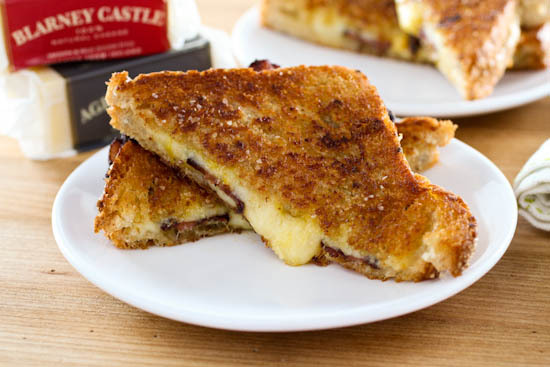 I love a good grilled cheese sandwich so much there can’t be one single sandwich at the top of my list! Don’t forget how terribly greedy I am. For this sandwich I wanted a sweet yet nutty bread, so I chose a seeded multi-grain bread. You can use whatever bread you have handy, but I highly recommend the multi-grain approach for two reasons. First, the bread has a lovely natural sweetness that his enhanced by the toasting it gets in the buttery pan. 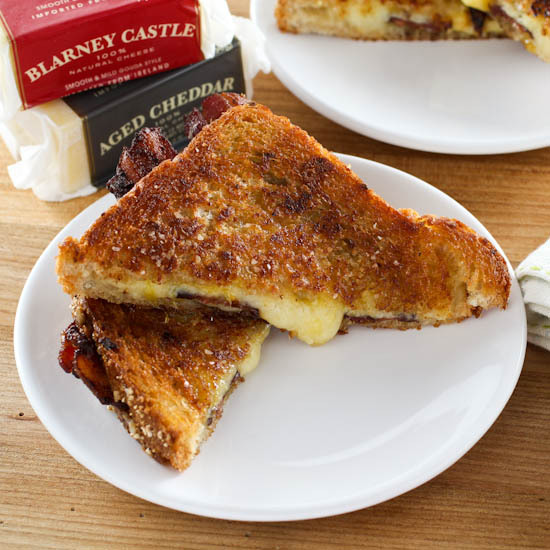 Second, multi-grain breads have a nutty flavor that pairs well with the Kerrygold cheese I selected for this sandwich – Blarney Castle and Aged Cheddar. 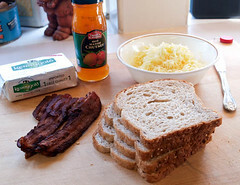 Hot mango chutney also pairs well with the cheeses, so I spread about a teaspoon on each slice of bread. It not only tastes fabulous, it helps the shredded cheese adhere to the bread. The bacon I added simply because I like bacon, but it plays well with the chutney and cheese, and makes the sandwich a little more hearty and filling. This is good as a quick meal with a salad or cup of creamy soup, or you can make a few sandwiches and cut them into fingers for a cocktail party. Nothing soaks up the booze-woozies better than a grilled cheese. Begin by preparing the sandwiches. Lay the bread slices out on a cutting board. Spread each slice with about a teaspoon of mango chutney, then top each with the shredded cheeses. 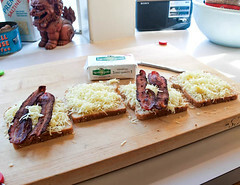 Place two bacon strips on two of the slices of bread and then top with the cheese only bread slices. 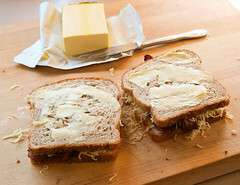 Spread the top of each sandwich with two teaspoons of butter. Heat a medium skillet over medium heat and add 1 tablespoon of butter. 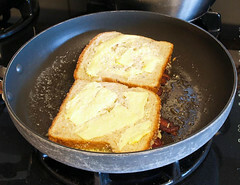 Once the butter melts swirl so it coats the pan and add the sandwiches butter side up to the pan. Sprinkle the tops of each sandwich with a little sea salt, if desired. Grill the sandwich until it is golden brown, about 2 minutes. 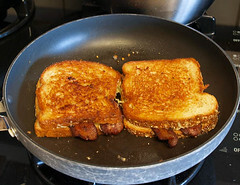 Carefully flip each sandwich and grill for another 2-3 minutes, or until the cheese is melted and the bread is dark golden brown on both sides. Remove the sandwich to serving plates and cut in half. Serve immediately.